Soft and feminine! All over curl. Shoulder length. Medium length, soft spring curls layered and shaped to the head. Featuring hair, which is heat friendly, for different styling options. See item details for available colors. Jon Renau, Kate! Flipped for fun or curled for seduction, this versatile shoulder length bob maximizes styling options with 100 % human hair and an undetectable lace front. 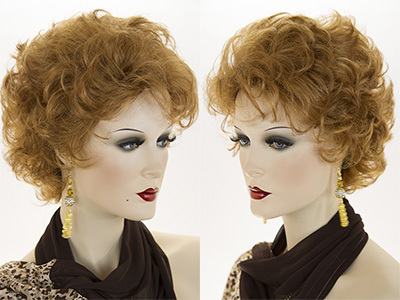 Premium quality short human hair wig with soft curls and a layered tapered back. This classic style comes in natural shades of blonde, red, brown and brunette. See item details for available colors. Feminine, short, wavy, layered wig tapering at the nape. Natural looking rich shades of blonde, red, brown and brunette. See item details for color selection. Stunning short, straight jaw length bob with bangs! The length is 11 inches. Featuring a natural looking off center skin part. See item details for color selection. Chin length short wavy bob with soft tousled curls and a tapered back. Available in natural looking shades of blonde, red and brunette. See item details for the color selection. Jon Renau Halle! This short, sassy pixie cut will give you rock star style on even the dullest of days. 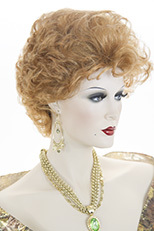 O'solite construction makes this wig comfortable and discreet. 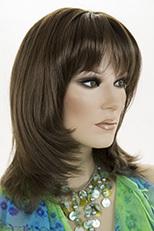 A short straight wig with the look of an expensive salon cut for a fraction of the price! Available in natural looking shades of blonde and brown. See item details for color selection. Jon Renau Linda! This short bob sharpens a classic style with the posh look of blunt or sideswept bangs. The SmartLace front and monofilament cap ensure a natural, comfortable fit. 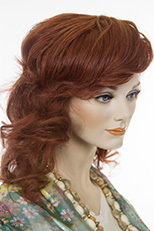 A stunning wavy layered shag style wig! 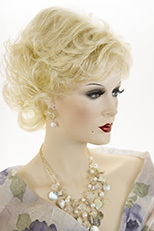 This lovely hair style is available in natural looking shades of blonde and red. See item details for color selection. A chic, medium length, straight, layered bob style wig with bangs. Natural looking shades of blonde red, and brunette. See item details for the available colors. 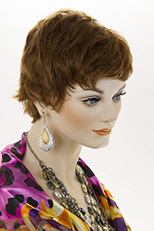 Chic youthful short gelled look pixie style wig! The razor layered edges are styled in wet look piecey chunks, which can be worn with the wet look or brushed out. See Item Details for available colors.